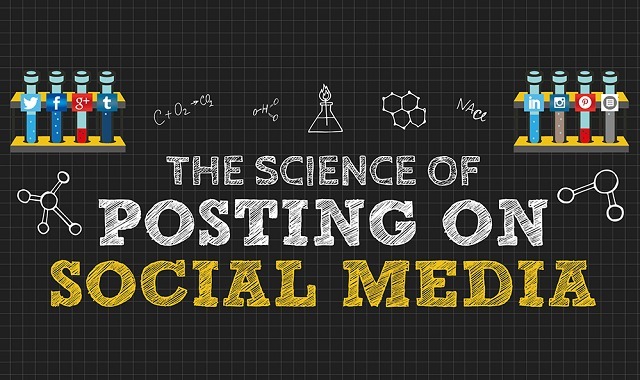 The Science Of Posting On Social Media #infographic ~ Visualistan '+g+"
Facebook – The best time to post on Facebook is between 1-4 p.m. This is when you can expect the highest click-through rate. Take into consideration each time zone, and make any adjustments from there. The peak time is on Wednesdays at 3 p.m., and the worst time is to post on weekends before 8 a.m., and after 8 p.m. Two posts per day is adequate. Pinterest – Five Pinterest pins for day is par for the course. The best time is on Saturday morning, and the worst time is during normal working hours. Peak times are on Friday, between 1-4 p.m.
Twitter – Three posts per day are recommended. The best time is Monday-Thursday, 11-3-pm, and the worst time is every day after 8 p.m., and Friday after 3 p.m. Peak times are Monday-Thursday from 9 a.m. to 3 p.m.
Instagram – Post twice every day. Best times are Wednesdays from 2-5 p.m. The worst times are between 9 a.m. and 6 p.m. Peak times are on Thursdays. LinkedIn – Best time to post is Between Tuesday and Thursday. Peak time is noon and 5-6 p.m. The worst times are on Mondays and Fridays between 10 a.m. and 6 p.m. Post no more than once a day. Google + - Three posts per day is recommended. Best times are Monday through Thursday, between 9-10 a.m. Peak times are Wednesdays, and the worst times are early morning and evenings. Blog Posts – Best time are Tuesday through Wednesday, from 9-11 a.m. The worst time is on Mondays and Fridays, from 10 a.m. to 6 p.m. Peak time is on Tuesdays and Wednesdays. Two posts per week are recommended. Tumblr – Best time is on Friday evenings at 7 p.m., and the worst time is before 4 p.m. Peak times are Sunday through Tuesdays, 7- 10 p.m. Post twice per day.